Each Thursday for the last three months we have been running one of our popular after school Comics Clubs at The Circle in Staffa Place. The Circle is a hub for charities, social enterprises, community groups and socially aware businesses in Dundee. They provide affordable offices, co-working and community space. By bringing organisations together, they are promoting collaboration and fostering innovation that does social good in the city. It has been a pleasure working with The Circle to help make our Comics Clubs accessible to more young people across Dundee. We are proud to be able to launch a new Comics Club Anthology at The Circle featuring comics by the young people who attended the workshops there. On Sunday November 25th The Circle is partnering with their tenants to host a Yuletide Fair. It will be an afternoon of festive fun, including food and drinks, local business stalls, Santa’s grotto and much more! And DCCS will be there! Come along between 12-4pm to pick up a copy of the comic and see what else The Circle has to offer. Posted on November 21, 2018 November 20, 2018 by dundeecomicscsPosted in Comics Club, EventsTagged anthology, christmas, comics, Comics Club, dundee, launch, staffa place, the circle, xmas, young people, yuletide fair. Check it out – fresh from the printers, Comics Club Volume 3: Guardians of the Comics with a cover by Comics Clubber Darcey Maltman. The comic will be launched this Friday (July 13th) between 1-2.30pm at The McManus Galleries. Come along to the learning centre on the first floor to pick up a copy and take part in a drop-in comics session! 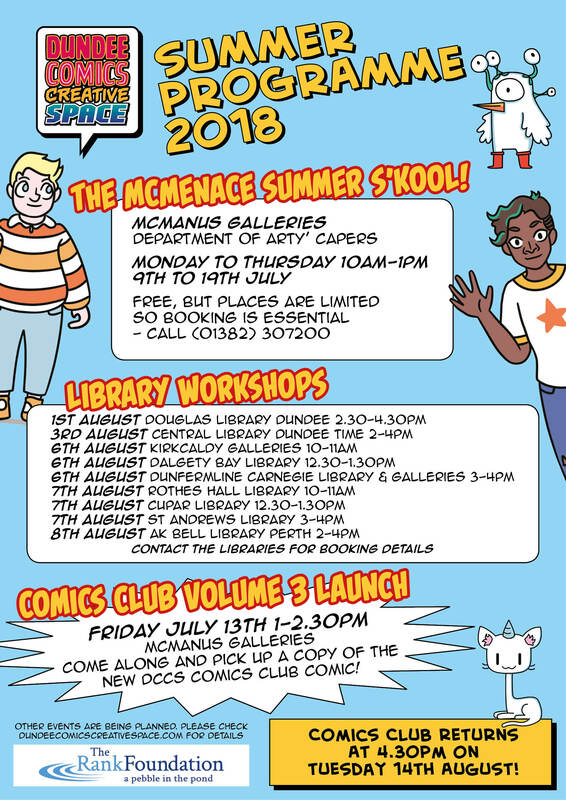 Posted on July 11, 2018 by dundeecomicscsPosted in Comics Club, EventsTagged anthology, comics, Comics Club, dundee, launch, mcmanus gallery, young people. There are blue skies and it is super hot outside – it must be the summer holidays in sunny Dundee! Last week was the last week of school and also the last week of Comics Club until after the summer holidays – Comics Club returns on Tuesday 14th August. But fear not comics fans! DCCS will be on tour, bringing comics to you! First up, from 9th to 19th July on Monday to Thursday 10am-1pm, we will be running the Department of Arty Capers as part of the McManus, sorry, The McMenace Summer S’kool! If you would like to come along contact the McManus on 01382 307200. Then on Friday July 13th we will be launching Volume 3 of our Comics Club anthology called Guardians of the Comics. Come along to the McManus from 1-2.30pm to pick up a copy! Later, in August we will be doing workshops in libraries and community centres across Dundee, Fife, and Perth. See the flyer below for details and contact the venues if you would like to come along! Posted on July 4, 2018 July 4, 2018 by dundeecomicscsPosted in Comics Club, EventsTagged anthology, comics, Comics Club, dundee, libraries, mcmanus gallery, summer, tour. This Friday come join us at DCCS for the launch of the very first Ink Pot comics anthology – the wonderfully titled INKTHOLOGY. INKTHOLOGY is themed around the magical properties of ink and each artist and writer has contributed an original stand alone story. The collection features Ink Pot artists alongside guest spots from other artists closely associated with Ink Pot and DCCS. From 7pm come along and meet the artists and purchase your very own copy of INKTHOLOGY. Special events on the night include DeeCAP comics performances with live music and a special Speech Bubble comics panel. There will also be the chance to see an exhibition of art from the comic curated by Zu Dominiak. Posted on June 6, 2018 June 6, 2018 by dundeecomicscsPosted in Events, local comicsTagged anthology, artists, comics, fantasy, ink, Ink Pot, inkthology, panel, performance, science fiction, speech bubble, stories.